The /C-like /Q works pretty well for me; the one with the /Oslash-like construction too. The ones with the enclosed grain of sand in the bottom left irritate me, though. Too much visual noise. Something like this for /Q? Though this looks like an /Odieresis. Could we get away with subtle rounding (3)? It is cleaner; a cheat in the top area is more easily seen and disrupting than in the middle. The middle one work best in my opinion. The softening is out of character and introduces an element of self-doubt in that bottom half. How about such change to /g? I think it looks more balanced now. I'm still not sure if it should be as a default character for the lowercase. But I don't feel confident enough about the uppercase G to leave it on its own. 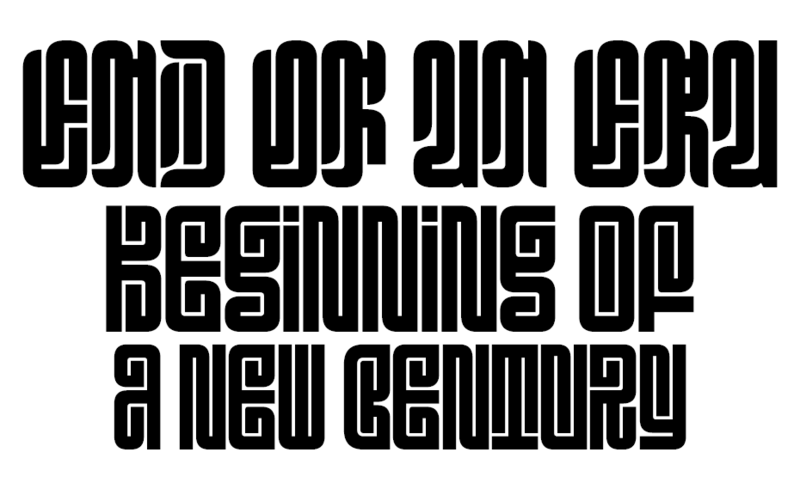 The new blackletter approach is all kinds of awesome! It needs to be made into a full typeface, perhaps even with a proper lowercase. EDIT: Just looked at the PDF, too. The blackletter is too illegible in all-caps, methinks, as is usual for blackletters... definitely needs a lowercase. The Trippy, Pixel and Info cuts all work very well! Not so fond of the Goth, but I guess that's a matter of taste. I just noticed the /eight is still quite cheaty and less legible than all the other figures; might want to think that one over. New proportions of /g/ are good! I liked how the more rounded forms were coming along, while the caps begged for more corners, so I created two sets of lc. They somehow fit the original caps, too, though look kind of narrow next to them, while with the Fraktur there is no such effect, since all Fraktur capitals are double-struck which optically narrows them down. New pdf with the Fraktur typeface character set below (along with most diacritics, which were made in a breeze, but some adjustments are due). The current style works quite well for the blackletter caps. Some adjustments might be necessary to work with the Radiator caps; namely, you might be able to pull off a cheatless version for that purpose. For the blackletter, cheats are fine, and in fact some lc letters look too static and lifeless compared to the blackletter caps. 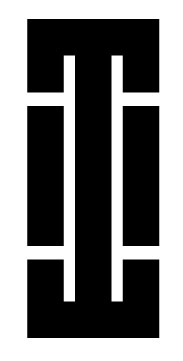 The /e in particular firmly belongs in the default Radiator camp and needs something livelier for blackletter. The /f is just very ungainly for any purpose (maybe give it a descender, or a rising foot as in /t? ), and the /t might look better with a purely horizontal crossbar and the foot raised all the way up. If you're giving the /g and /z a full descender, then /j and /y probably deserve one too. You could give them a downturn at the end to make them less heavy. The tittles irritate me. I'd suggest either a simple square, or a leaf with sharp bottom left and top right. EDIT: Also, I find both /w and /W hard to read. Similarly, /S parses as /G for me, and /Q /U /V are illegible. The /A might be more pleasant if the bottom left were lightened a bit through half-cuts; right now it's a bit spaghettiesque. EDIT: Also, maybe some Fraktur caps could get a descender too, if you're doing that for the lc...? Here are some quick fixes (middle shows the square cut, top and bottom — the round cut — for now the ideas live in three planes, main, square, and round). The /e could get an incision like /a, but I'm not fond of it. I have an uncial / lunate epsilon-like form at the back of my head. The descenders are minimal — only 80 units, so that's not even a whole level (this would need 20 more for the gap). 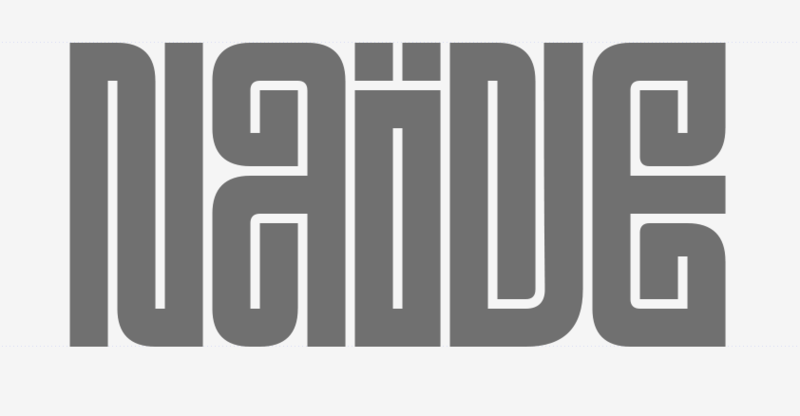 I agree /y looks better with a full descender — it eats into the body as in /g. If it shows too much maybe I should go down by 10 units. But I don't believe /j deserves a full descender - it already is as full as it can get, as there is no room for a bigger descender without colliding with preceding descending letters. Maybe I could try contextual approach, though, but not for the default variant. (For the regular font, this /j is a cheat, though. Maybe Futuresque straight cut /j would work better). I guess a descending /f is the only way to call this Fraktur, though. How about a circular tittle? The leaf looks fun and Blacklettery, too. It looks a little light but I like that (the arched hairline you can observe below /c in "Factum" above is the prototype tittle). I must let go of the Gothic ideas and just start making things that “work for today and tomorrow” (—H. Papazian). Shouldn't /e and /o be angular on the top right side rather than on the top left? I agree, Textura is generally nicer than Fraktur. I'm notoriously allergic to historic accuracy, though, so my own blackletters tend to mix and match whatever features I like best from a variety of styles. I am always a big fan of legibility challenges. This is sweat. I liked the F from Mar. 10th. I think the i should be full width, maybe following the T, but with upswings from the bottom serif too? The B doesn't work for me, with its disconnect. I prefer the C with the hollow center to the 'cut core', but am fine with the 'cut core in the O, though I also like the O from the AORIST OCEAN ROOM sample. I think the top /I is jarring. 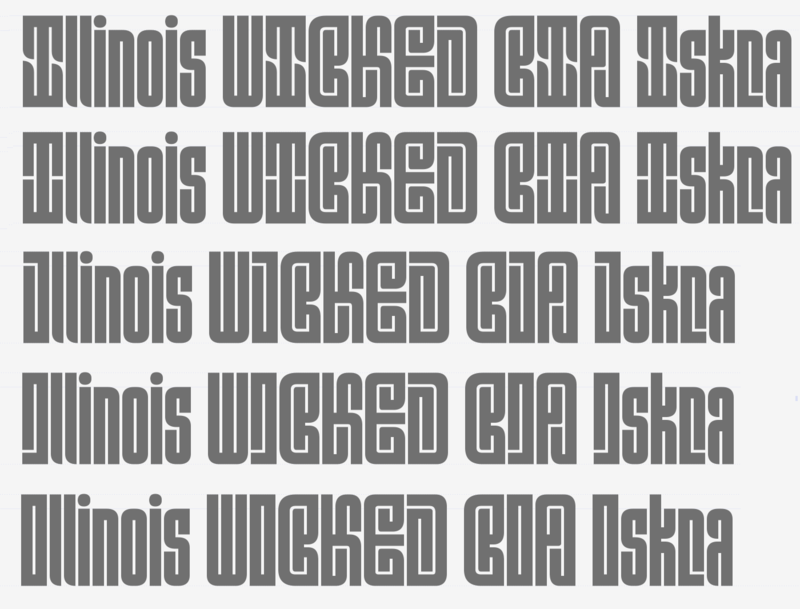 The second one stands out, too, but I think it kind of works with the lowercase (though the roundings in the serifs, well, are cheats). How about a two-column approach? I prefer the one cut in the top. What if we cheated big time? This is interesting too, but I bet many will find it irritating. Definitely it is really obvious. I like the two-column approach with the slit above best. It makes for the most readable words, too. The three-column versions are really hard to read, since they go against the very nature of /I. Digging through the thread, I noticed a missed remark of yours, you said that /H looks too much like an /N. At first the flipped /H looked like it was leaning left to me, but it passed. This new direction of the tucked in terminals is rebelliant to the rest of the font (A, U, V), but I guess it doesn't show. Btw we never talked about the accents eating into the base characters: does it work? Here's a review of B's up for a voting. The second one is cheatless, but somehow not very legible/out of character too me. I admit the double spiral /F is adorkable despite my initial distaste. Not sure if for the main cut though? On the left is my variation of Christian's original idea, current default on the right. 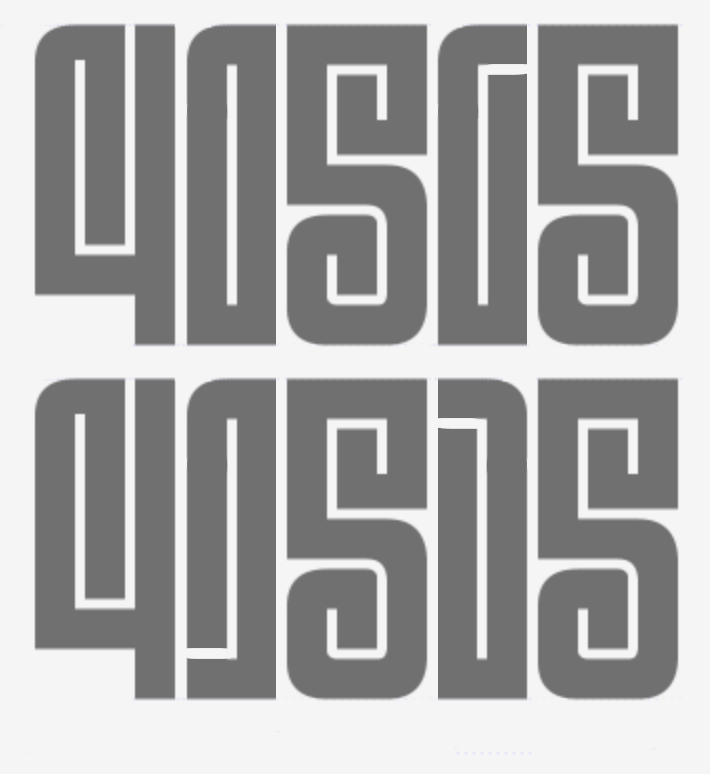 The spiral variant of O is staying in the floral trippy variant from the pdf, I guess. Of C's, I'm still fond of the single spiral approach. /Q is such an exotic letter I think you'd have to try really hard to read it "by accident". Do you think it makes sense to let /I and /C be the only letters hollowed in the middle? As opposed to the Pixel cut where every letter has it except for N and Z.
I think I like that second to last C with the tucked in top serif. 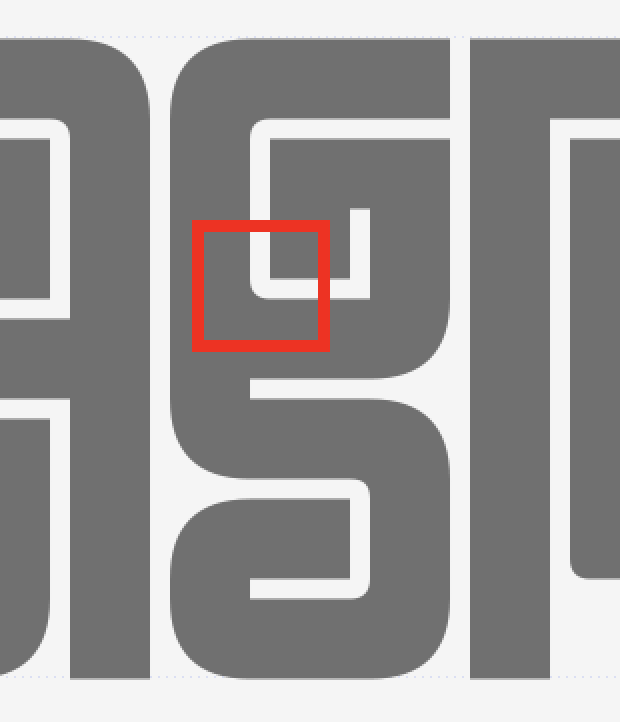 Did/would you consider a C (and other letters beyond I) that was 2 squares wide rather than 3? I think this is rather ungainly. Though with the single-column /i, it makes for a certain impression. Definitely worth exporing. More like Octant again. And a flipped version of the previous variant. Oh, by all means I did try out your idea, Beau. New /H works well for me. Accents eating into base letter is in principle fine, but might cause trouble with letters that depend on the full range of the parameter space to be legible. However, making the accents use 1.5 columns causes me physical pain. In fact, I might go so far as to suggest making all accents into simple dots or full-width horizontal lines, at least for a stylistic set... most languages don't need to disambiguate between too many accents. For French, for example, I can't think of a minimal pair other than dés and dès, and I'm sure that one won't cause any trouble. I'm sure there are some language for which that is definitely false (Hungarian comes to mind), but for German, for instance, a single bar for ¨ would work just fine. I think the rightmost /F works best, and my double spiral works second-best. The asymmetric double spiral is less attractive than either of the other, methinks. You can probably pull off your single-spiral /C for the Trippy style. Otherwise, the last in line should also work pretty well there. The Cormorant /B is eye-catching, but I'm not sure whether it scans as a /B instantly. Maybe if you closed it on the bottom? Certainly only something for the info cut with its hermetic forms, I'd say. The very last /B works surprisingly well! The fasces-/I doesn't work for me. Lowercase in the pdf for both Fraktur and ... Roman? Grotesque? 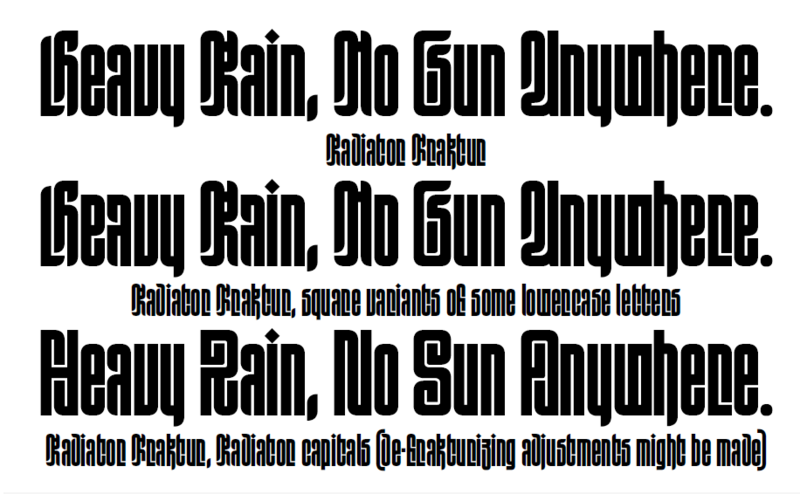 I just called it Radiator Text, not to confuse with Textura. I have to say the two-column /I is less legible to me in extended paragraphs. But after all, extended paragraphs are not meant to be set in any kind of all caps. As for the /e that I proposed: I'd separate the two strokes in the top left properly; no need for this new kind of cheat. It should help the /e fit in with the /a. I'm assuming the filled-in /o is a glitch? Have you tried an /x with one straight side and two branches on the other side? The current one does work, but it's pretty contorted. And it might need a descender in the Fraktur? Have you tried cheatless punctuation? Make the comma, hyphen and quotes vertical lines, periods either horizontal lines or pixels. Exclamation mark should be at least double-column. Asterisk could look like a double /Ψ. How about this non-descending /f? I think your descending version works well. This style could also be adapted for a descender, though (bring it down one more level).